Mezzanine floors are an efficient way of creating more space in many commercial buildings. If you wish to use your space more effectively, mezzanine flooring may be the right solution for you. We specialise in utilising unused space by building upwards. Modern sectional steel mezzanine floors provide a quick and easy way to increase the space available in your premises. We are able to construct mezzanine floors in Bedford which are suitable for any use including storage, offices and showrooms and are able to advise on the correct loadings, escape routes, fire protection and detection systems. Commercial Interiors & Storage Ltd is a distributor for industry leader Hi-level Mezzanine Floors Ltd. Whether you require space for industrial storage or a showroom, we have the solution for you. All the floors have a bespoke design to maximise space and minimise cost and they are built to meet your requirements. All of the floors that we supply are designed to meet the current regulations and we can even act as your agents in obtaining Building Control Approval for works carried out. Hi-Level mezzanine floors are a versatile and cost effective solution, creating more space to your business environment. Looking for more ways to use space efficiently? Please take a look at our partitioning and shelving & racking services. We also offer complete interior solutions for your business. Contact us today to find out more about mezzanine floors. Either call 01234 824444, or use our online enquiry form. 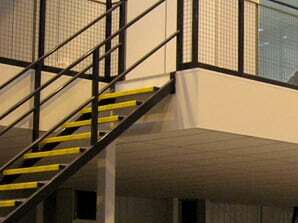 We supply mezzanine floors to Bedford, Milton Keynes, Cambridge and the surrounding areas. We can help you to use your space more efficiently with mezzanine floor solutions. Free site surveys, design and quotations complete with scale CAD drawings for all Mezzanine floors. We cover Bedford, Milton Keynes, Newport Pagnell, Bletchley, St Neots, Huntingdon, Cambridge and Northampton.